Charter an exclusive dive with your friends and family or have a sunset party. We provide the captain and mate of the vessel to provide you with the best time you can have on the ocean. Offer a unique experience for your wedding party by showing them the Keys from a whole new perspective. Put together your underwater hunting party and go after those sneaky spiny lobsters. Spend the day at the sandbar, meeting people with our boat as your home base. Tell us what you want to do on the ocean, and if it is legal, we can work with you to make it happen. Each half and full day private charter includes the crew, snacks, water, soft drinks, tanks, and weights (for diving). A half day charter is four (4) hours and a full day charter is 8 hours. The four and eight hour charters can be designed anyway you would like the charter. Birthdays, Wedding parties, special occasions, and more, The charter comes with a captain and mate for that timeframe and the rest is up to you. We can work with you and let you know the services available in town that will can meet your needs. Charter the Jolly Roger, our 45-foot Corinthian Catamaran, for a full day or half day on the ocean in the Marathon waters. The Jolly Roger can accommodate up to 45 passengers. It is a spacious vessel and very seaworthy with a large top that provides protection from the sun. It is an excellent dive boat, but has the versatility to become so much more. 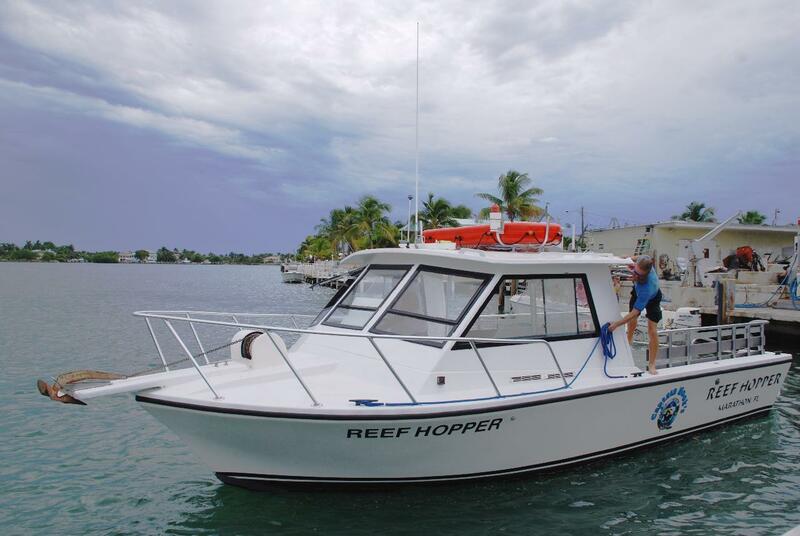 Charter the Reef Hopper, our 31-foot Island Hopper, specifically designed for diving with an open back transom for easy off with a giant stride and easy on with a beefy dive ladder that will handle fins and big feet. The Reef Hopper can accommodate 10 divers or 22 snorkelers. The choice is yours. If you have a number of divers in your party, a charter is both economical and private. We can tailor most any private charter to meet the needs of your party. 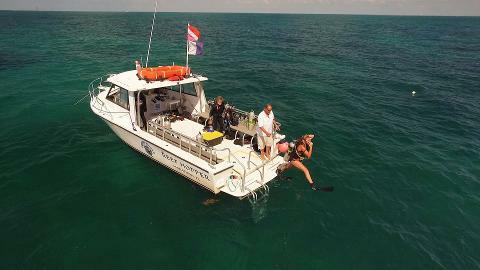 Our resources include dive instructors, fishing captains, dive captains, spearfishing experts, all with local knowledge of the waters and the hotspots in the Marathon and surrounding communities.